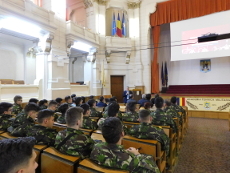 Students and researchers from the Technical Military Academy of Bucharest, an institution that trains Romanian military engineers, discovered code_aster and Salome-Meca during the week of 21-25 November. An on-site presentation and demonstrations paved the way for the creation of a digital simulation center around code_aster. Our code will thus be challenged on new problems and opportunities are in sight for collaborations in the field of dynamics.